Not my words, but the words of Henry Winkler, more commonly known as The Fonz. 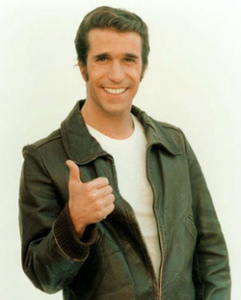 But why would a man, most famous for saying “Heyyyy” as the Fonz in the American TV show ‘Happy Days’, come out with such a powerful statement? 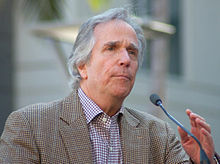 The simple answer is that life for Henry Winkler was not always filled with ‘happy days’ and it was not too recently in the UK when he was awarded the OBE from the Queen, that I am sure the majority of the population would have been unaware that Henry Winkler suffered as a child with serious dyslexia. apart from co-writing 17 books about a young boy, Hank Zipler,http://www.hankzipzer.com/ who suffers from Dyslexia, also travels across the globe talking in schools, halls and on TV about literacy, dyslexia and how we all have to make the most of your talents, whatever they are. 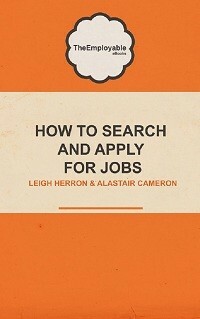 He helps to inspire people to get past their personal challenges to see what they can actually achieve. I think there is a message in there for everyone, don’t you? 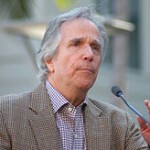 So Henry Winkler, made me start thinking (and that takes a lot), who else that is ‘famous’ has had to get past some obvious obstacles and difficulties, but still has become the very best that they can be and most often or not the best that there is? Check out this list below and remember its only Monday, we still have the rest of the week to get thinking, doing and creating….and as Mr Fonz quite brilliantly summed up; We have to do and make the most out of ourselves…If we don’t, something very important will remain undone forever…..Hail the Employable!! Agatha Christie is the best-selling author of all time – is reported to have had dysgrapia, which is a learning deficiency in the ability to write, primarily in terms of handwriting, but perhaps also in terms of coherence…. Walt Disney, was reportedly let go from a Kansas City newspaper for not being creative enough…and was also termed slow as a child…. Albert Einstein, most famous for his Theory of Relativity, probably had Aspergers Syndrome, which is a form of Autism and it is also suggested he was dyslexic…. Richard Branson – the well known Entrepreneur and businessman suffers from Dyslexia, but he decided to start a school newspaper anyhow and the rest of his entrepreneurial story is history…. …..I could go on, and perhaps the message should be, that we all have a talent, so we just all have to go out and try and find it. Happy Days! !